You don't want to dwell on how it's possible to be hurt by a horse. Many horse owners have never been seriously hurt by their horse. There's certainly no reason to be afraid of horses. However, when you are working with an animal that is large and reactive, you are putting yourself at risk. If you take care and learn to understand horses, you can reduce the risk of injury greatly. The Canadian Hospitals Injuries Reporting and Prevention Program (CHIRPP) states that 49.6% of horse-related injuries required either 'advice or minor treatment'. So while there is always a danger you could be hurt, many injuries are minor or preventable. Here's a list of common injuries that could occur as you work with or ride your horse. Riding boots or sturdy shoes protect your toes. Getting your toes crunched because you didn't move out of the way quickly enough is common. Even experienced horse owners occasionally don't move their feet as fast as their horses move theirs. This can lead to bruising, abrasions, and even fractured bones. 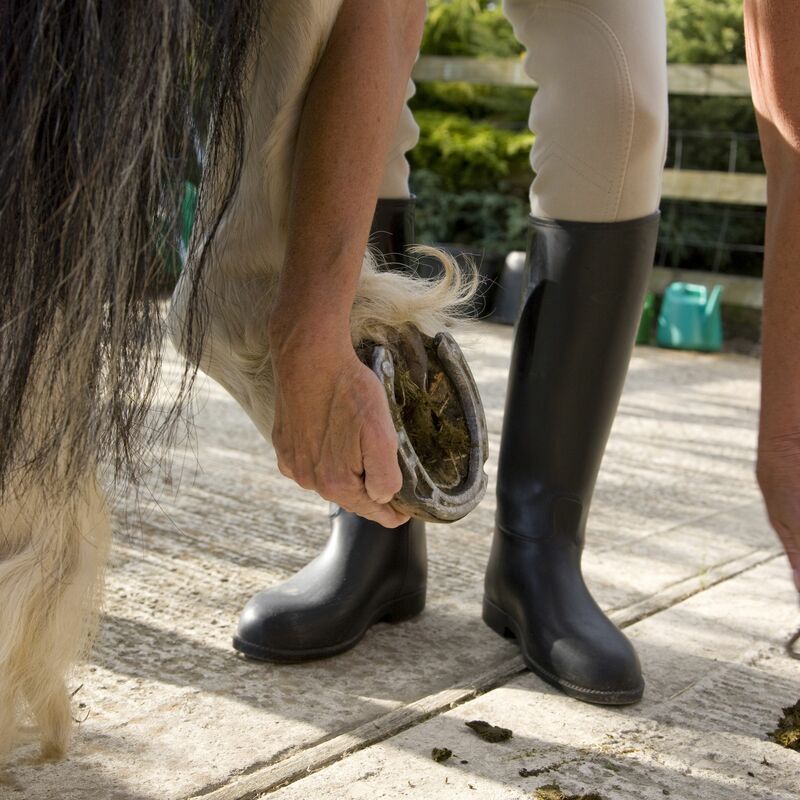 It is possible to have your fingers stepped on, say when cleaning hooves, but far less likely. After a fall, it's possible that the horse might step on you, but often your horse will do what it can to avoid you. Horses can strike out with their front or rear hooves, and they can strike out backward and forwards with both. Sometimes, kicks are accidental, such as when a horse kicks at a fly and the handler gets in the way. Some kicks are intentional. Getting kicked by another horse while riding is also a risk, so be sure to keep a safe distance between horses when riding in a group. According to the CHIRPP, 62% of reported horse-related injuries occurred due to falls. When you fall, almost any part of your body can be injured. You may injure your face, break teeth and bones or receive abrasions and bruises. Breaks or strains to arms, wrists and collar bones are common when riders try to break their fall by putting their arms out, as the rider in this photo is doing. Riders have been badly injured when a horse steps on or falls on them. And of course, the leading cause of death in riders is head injury. You can learn how to fall. But that doesn’t mean you’ll be able to avoid all harm. While a helmet won't guarantee 100% protection, statistics bear out that they do decrease the risk of traumatic brain injuries greatly. It's easy for a horse to accidentally bite you. Horses bite to defend themselves or to express irritation and impatience. Some are sneaky and disrespectful. Horses that get pushy about being fed treats can become demanding and bite fingers and arms. Horses can bite hard enough to break fingers and can cause severe bruising and cuts. It's possible to be knocked over by your horse, especially when going through narrow doors. Getting knocked over by a horse is possible while it is loose, tied or being led. The more you work around a horse, the less likely this becomes, as you learn to anticipate what your horse is thinking and will do next. Getting knocked over can lead to sprains, bruises, and broken bones and teeth. A horse can also toss its head back and hit you in the face while riding. A fall can result in a sprain. When you first learn to ride you will be waking up a few muscles, some of which aren't really used in other sports or activities. Many people will feel a strain in the muscles along the inside of their upper leg. Others may feel their calf muscles, either along the outside or at the back, tired or strained after a ride. Backaches are common and can indicate a poorly fitting saddle, or poor riding position. Shoulders can become tight and strained. The good news is, as you strengthen and stretch these muscles, and learn to ride better, most of these pains will go away. However, there are other strains that can happen by accident. A lot of things can happen as you fall including, straining or spraining joints and muscles either on the way down or as you land. If your horse suddenly spooks as you are leading it, your arm or shoulder muscles may get pulled. And, and sudden overexertion—such as lifting your saddle, a bale of hay or carting a load of manure incorrectly, can cause muscle strain. Safety stirrups are designed to help prevent drags. Being dragged from the ground, or getting dragged after a fall can result in some pretty nasty injuries. Even a relatively small pony can drag an adult around, causing muscles strain, and abrasions if you lose your footing. Of course, whether you're dragged while handling or hung up in the tack, there is a danger of being kicked while you're down there. Getting caught in the stirrups can lead to very severe injuries if the horse spooks, runs and kicks. Thankfully, being dragged can be largely avoided by learning to lead a horse properly and using safety stirrups and proper footwear. On trail, riding under low branches can be a hazard. Trail riding often means you encounter low branches that can scratch, stab you and even sweep you off. In an arena, it's possible to be taken through low doors, or bump into walls or obstacles like jumps or barrels.